Black Cats helicopter Display Team - Display Teams - Military Airshows in the UK. Display Schedule. The Black Cats are the Royal Navy's helicopter display team and perform using two Royal Navy Lynx helicopters. The carefully choreographed display features a full display of the precision and aerobatic capabilities of the Lynx. The acclaimed aerobatic display has been described as an aerial ballet but also features high-speed crosses, close formation work and opposing manoeuvres. The Team started in 2001 as the 'Lynx Pair' and have been the first official Royal Navy flying display team since the 'Sharks' disbanded in the mid-1990s. In 2004, increased support from the Royal Navy and Agusta Westland Helicopters saw the team reinvented as 'The Black Cats'. The team have however drawn from their predecessor's displays and use several manoeuvres, which were trademarks of the 'Sharks' 4 red Gazelle helicopters. The 'Black Cats' won the Steadman Sword for the best British participant at the Royal International Air Tattoo in 2003. The 2013 Black Cats Team consisted of just a solo Lynx Display. 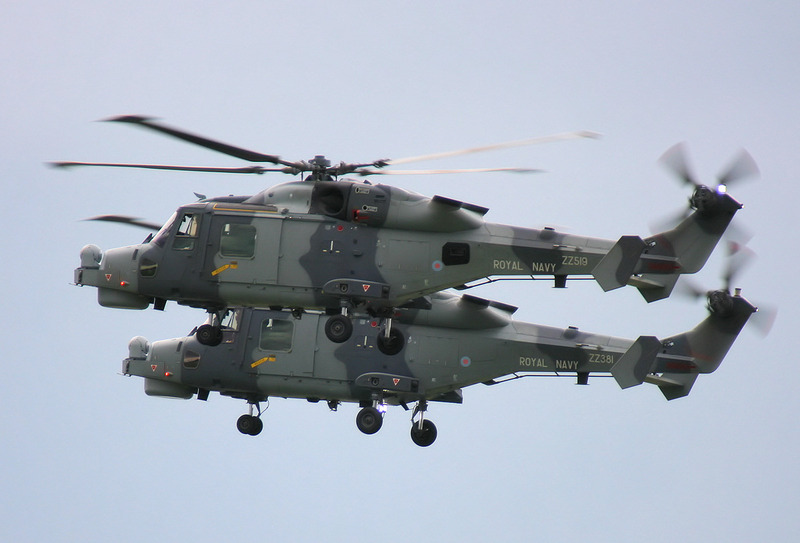 Due to the transition within the Royal Navy from the Lynx HMA.8 to the Wildcat HMA.2, the 2014 season included both types of helicopter, and the 2015 season saw two Wildcat HMA.2 helicopters display. The name 'Black Cats' is derived from the fierce cat depicted on the now disbanded 702 Naval Air Squadron emblem and the term 'blackcatting' which is naval slang for one-upmanship - doing or owning something better than someone else.